Comet 46P/Wirtanen. 2019 March 23. 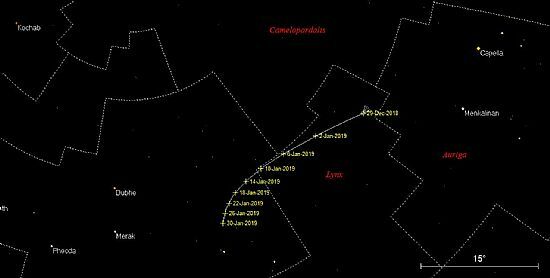 The first opportunity to search for the comet since the 3rd March. A break in cloud from 21h to 22h UT with good transparency (9/10) and variable seeing (av. 7/10). Wind SWW force 5-6. 2019 March 23, 21h 38m UT. Nikkor 200mm f/2 (2.8). A 30 sec. exposure D300 SLR ISO 2500. Limiting magnitude 15.0 approx. 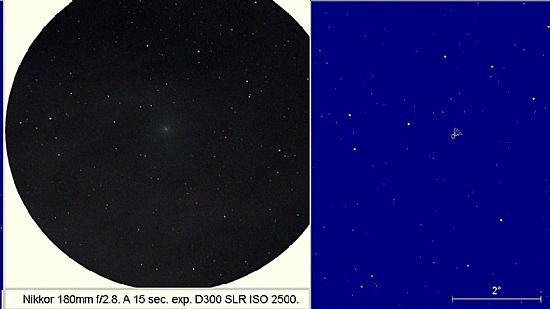 Longer exposures up to 45 sec gave no indication of the comet, either, that has now faded and “shrunk” in apparent diameter as not to be rendered via small lenses. Should the weather stabilize to allow the use of the 600mm f/4 on EQ6 mount, then we’ll give it a go! 2019 March 03: Comet 46P/Wirtanen Update. A fine night from about 20h 30m UT with good transparency (9/10) and variable seeing (av. 8/10). Wind SWW force 6. We have been following 46P for 82 days (see track) over which period the comet has faded some 4,000-fold. Of the many hundreds of images some 33% have been marred by the presence of artificial Earth satellites (AERs). At the present rate of increase in junk orbiting the Earth it will be impossible in a few years hence to secure good images of comets from the Earth’s surface. Nikkor 200mm f/2 (2.8). A 36.8 sec. Exposure D300 SLR ISO 2500. The brightest star in the field is TYC 3433-3-1 visual magnitude: 6.82. Limiting magnitude 16, approximately. Cropped image to exclude AES. 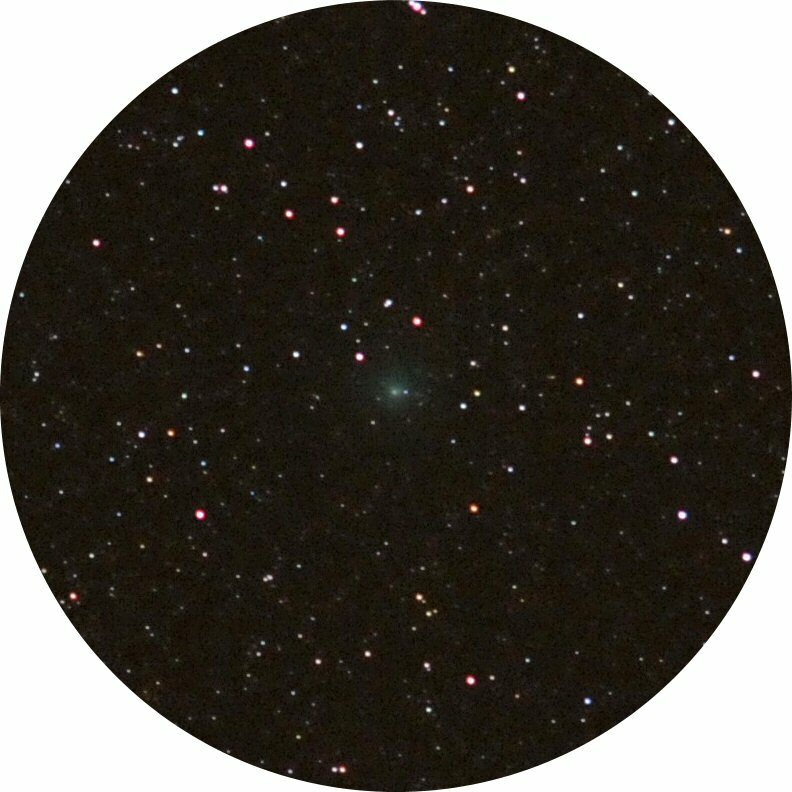 The comet (estimated integrated magnitude:13) is at the centre of the “highlighted circle”. Track of 46P over 82 days. 2019 February 25: Most recent observations for Comet 46P/Wirtanen:. 2019 Feb 23. A fine night with good transparency (9/10) but indifferent seeing (6/10) compromising images from 300mm + lenses. Photographic field (left) data: 2019 Feb.23 at 19h 58m UT. Nikkor 200mm f/2 (f/2.8); a 25 sec. exp. D300 SLR ISO 2500. Altitude of comet: +55.4°. 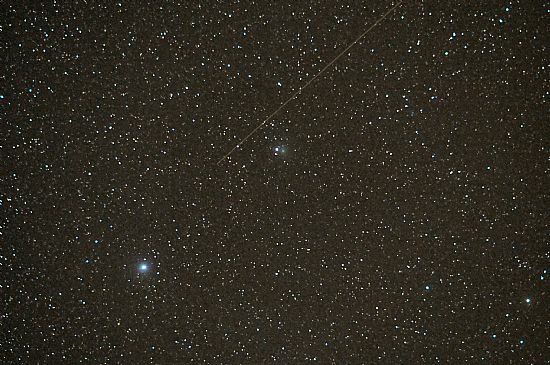 The star to the right of the comet is TYC 3429-59-1, visual magnitude 8.49. Limiting magnitude in field 15.5 approx. Distance of comet from Earth: 0.5059 AU (75.7 million km). 2019 Feb 10. A brief break in cloud offering good transparency and seeing, the first opportunity to observe the comet in eight days. 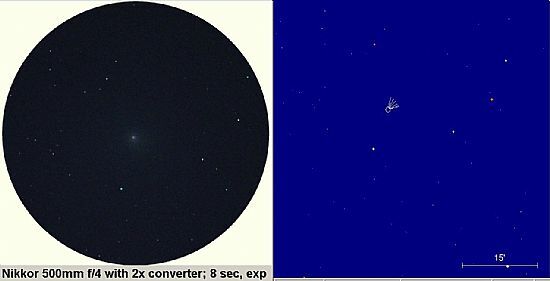 Position of comet between two white lines shown on scale "diagram" (right). Photographic field (left) data: 2019 Feb.10 at 22h 32m UT. Nikkor 200mm f/2 (f/2.8); a 30 sec. exp. D300 SLR ISO 2500. Altitude of comet: +73.1°. Brightest star in field: theta Ursae Majoris visual magnitude: 3.17 spectral type: F6IV. Star above Comet: TYC 3432-1273-1 visual magnitude: 9.65 with TYC 3432-932-1 visual magnitude: 12.26 close to the right of theta. Limiting magnitude 14.5 approx. 2019 February 02: A varied night sky with cloud coming and going (forming and dispersing); good seeing and transparency. A short display of auroral rays from a low northern band was only visible for a short period since thicker cloud set in at around 21h 40m. Good quality mages of the comet were obtained with the Nikkor 200mm f/2.0, Tokina 300mm f/2.8 and Nikkor 400mm f/3.5 at around 21h 15m. Comet 46P/Wirtanen. 2019 Feb 02: 21h 21m UT Nikkor 400mm f/3.5. 20.7 sec. exp. D300 SLR, ISO 2500. The brightest star in the field is STF 1346 visual magnitude 7.36 spectral type A2. The star to the left of the comet is GSC 3806-1517 visual magnitude 13.32. 2019 January 31: Comet 46P/Wirtanen. An intense double band, auroral glow reaching to the zenith and near to engulfing the region in Ursa Major close to the direction of the comet. A slack, but cold NW airflow with ground temperatures below freezing, all conspiring to make another challenging night's work! Good seeing but transparency around 7/10 compromised by the auroral glow. 2019 Jan. 31: 22h 38m UT Nikkor 200mm f/2.0 (f/2.8) 20.7 sec. exp. D300 SLR, ISO 2500. The brightest star in the field is TYC 3809-758-1 visual magnitude: 7.59, spectral type: K0III-IV. 2019 Jan. 31: 22h 39m UT Nikkor 200mm f/2.0 (f/2.8) 20 sec. exp. D300 SLR, ISO 2500 (cropped image). Images were obtained with the 200mm f/2.0 at around 22h 35m. 2019 Jamuary 27. Comet 46P/Wirtanen. 2019 January 27: Another challenging observing session, the first for Comet 4P since the 19th January. An attempt was made at 19h 30m UT in a near gale force northerly wind with air temperatures close to freezing but cloud and light rain caused a shutdown. Another opportunity presented itself a little under an hour later with good sky transparency and the winter constellations blazing away! 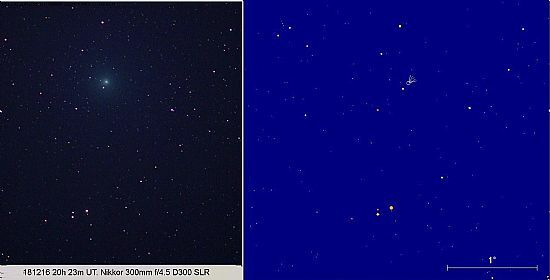 A number of quality images were obtained with the 200mm f/2.0 at around 20h 30m but light snow showers this time caused a termination. Nikkor 200mm f/2.0 (f/2.8) sec exp. D300 SLR, ISO 2500 20h 38m UT. The brightest star in the field is 17 Ursae Majoris, visual magnitude: 5.28 Spectral type: K5III. Nikkor 200mm f/2.0 (f/2.8) sec exp. D300 SLR, ISO 2500 20h 38.5m UT (cropped image). 2019 Jan. 19. Comet 46P/Wirtanen. 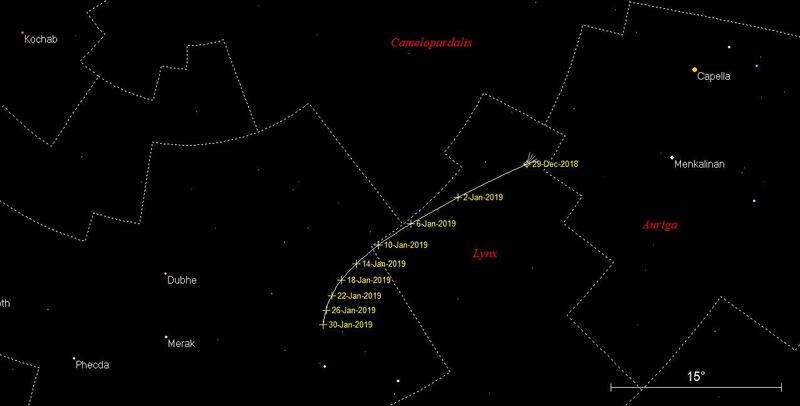 From our previously submitted observation of 2nd January the comet has moved some 12.8° from constellation Lynx to Ursa major where the comet’s apparent motion is slowing significantly. Weather conditions throughout this period have been appalling and this, combined with the Moon’s increasing phase, has rendered observations difficult to say the least. Despite these factors, we have managed to secure useful images with a range of equipment on January 06, 10, 16, 17 and 18. Most recently, early morning observations on the 18th, without a Moon, were made using: 105mm; 135mm; 180mm; and 300mm; f.l. lenses, the most rewarding being those from the fast (f/1.8) 105 mm lens. It will be interesting to take advantage of the lunar eclipse in the early hours of the 21st (weather permitting) to image the comet. 2019 Jan. 18, 06h 40m UT Nikkor 105 mm f/1.8 (2.8) 15 sec. Exp. D300 ISO 2000. Cropped image (4° dia. approx.) Brightest star in the field is TYC 3804-1774-1 visual magnitude: 6.34. Stars to visual magnitude 15 are visible on the originals. 2019 Jan. 02: Comet 46P/Wirtanen. Comet 46P/Wirtanen and foreground AES imaged 2019 Jan. 02 at17h 54m UT. An 8 sec. exposure with Nikkor 200mm f/2 (2.8) D300 SLR ISO 2500. How often, if at all, do we hear comment regarding this menace? Space is now a free-for-all where those with the dosh to fool about with high-powered rockets may litter the near-Earth space environment with what they please, from relatively small satellites (for any number trivial pursuits) to electric sports cars! Any exposure with a field of 5 arc-degrees diameter lasting more than 30 seconds is likely to be marred by these streaks of light. Comet 46P/Wirtanen imaged 2019 Jan. 02 at17h 57m UT. A 25 sec. exposure with Nikkor 200mm f/2 (2.8) D300 SLR ISO 2500. Limiting mag. 14.5. Sky transparency 8/10. 2018 Dec 29. Another poor, early evening sky. 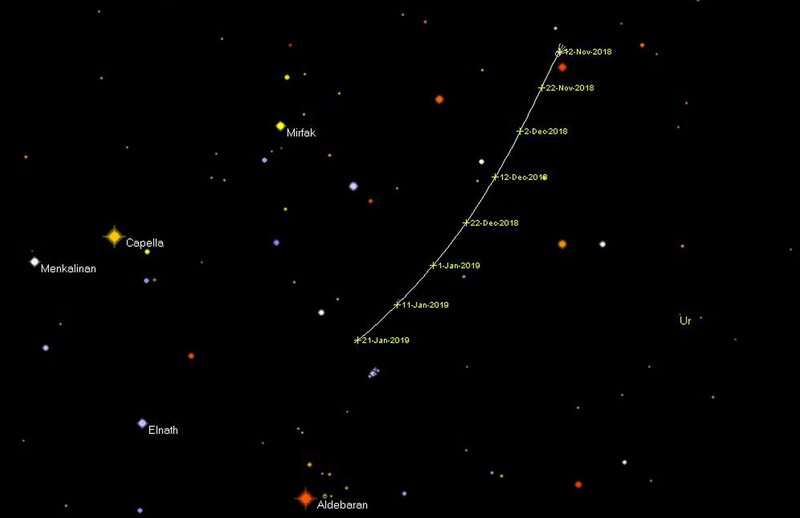 2018 Decemebr 29: Track of Comet 46P/Wirtanen to 2019 Jan. 30. Comet's distance from Earth: 0.7011 AU (104.9 million km). 2018 Dec 28. Comet 46P/Wirtanen. 2018 December 28, 17 h 30m. Nikkor 200 mm f/2 stopped down to f/2.8 A 20 sec. exp. D300 SLR ISO 2500. 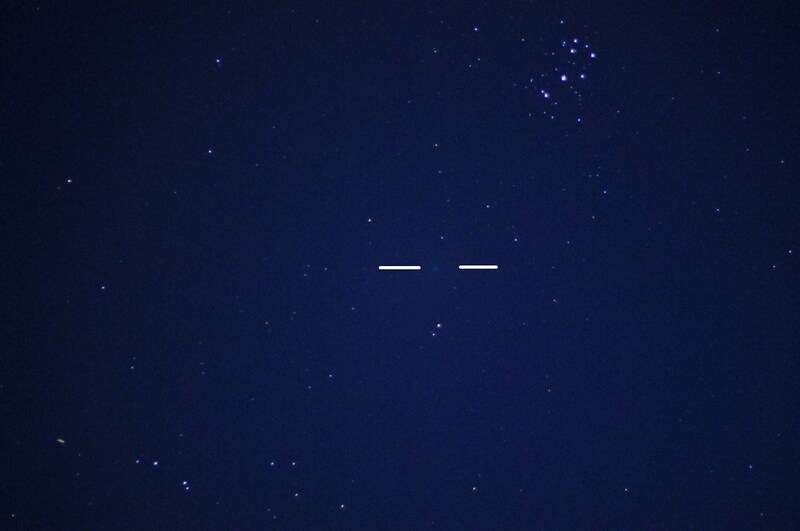 The brightest star in the field (cropped image) is 45 Aurigae visual magnitude: 5.34, spectral type: F5III. Limiting magnitude 12.5. 2018 Dec 25. 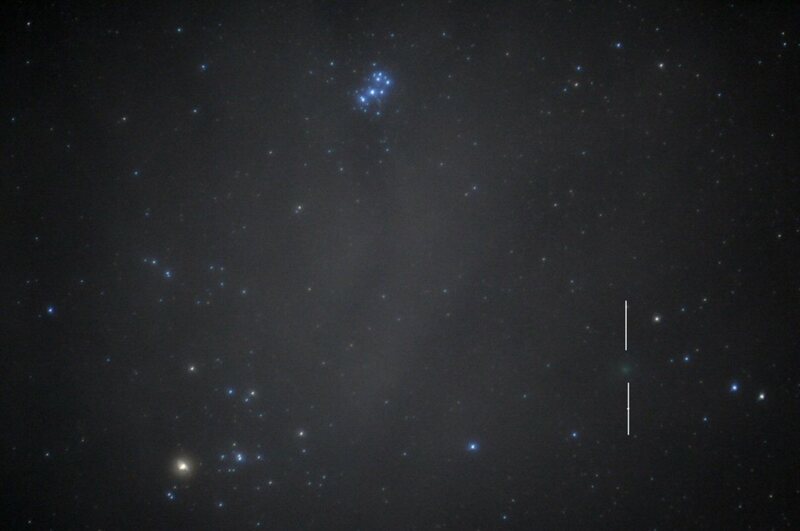 Comet 64P Swift-Gehrels at 18h 07m UT. The comet has faded significantly since our previous observation of December 09. Poor visibility did not assist, either. Nikkor 200mm f/2 stopped down to f/2.8. A 25 sec. exposure D300 SLR, ISO 2500. 17h 48m UT. The "orange" star just tothe left of the comet is the variable AY Arietis, maximum magnitude: 6.82, spectral type: K0IV. Cropped image. Poor visibility (transparency 6/10). The comet is barely visible in this image, The originals indicated an integrted magnitude in the region of 11.5. 2018 Dec 25. Comet 46P/Wirtanen. Two days of murky skies. The early evening of the 25th cleared for around 40 minutes in parts. Transparency was variable and changing quickly. Despite these conditions, we managed to image both comets. Results for 64P/Swift-Gehrels will be given shortly. We worked with a range of devices from a static 105 mm f/1.8 lens to equatorially driven 135mm, 180mm f/2.8, 200mm f/2 and 300mm f/4.5 lenses. 2018 December 25, 17h 32m. Nikkor 180mm f/2.8. A 20 sec. exp. D300 SLR ISO 2500. The brightest star in the field (cropped image) is omicron Aurigae, visual mag. 5.46 spectral type: A0p. Limiting magnitude 12.5. 2018 Dec 23. Comet 46P/Wirtanen. A cold, calm day with a slack NNW airflow and clear skies bringing temperatures close to freezing in the evening and early night. The comet appeared to within 1.4 arc-degrees of the brilliant star Capella. Despite the presence of the Moon (phase 98%) in Gemini, close by, it was possible to secure a number of good images with 135mm, 180mm 300mm (plus 2x converter) lenses. 2018 December 23, 17h 34m UT: Nikkor 180mm f/2.8 mm. A 4 sec, exp, D300 SLR, ISO 2500. Limiting mag. 11.5. 2018 Dec 19. Comet 46P/Wirtanen. The 18th saw winds of force 9 and a cloud-covered sky; today has been fine and calm leading to a reasonably clear early night but with a Moon at close on 90% phase and only 30° from the comet. With this level of sky illumination it was decided to attempt imaging with the 500mm f/4 singly and with a 2x converter yielding a focal length of 1000mm..
2018 December 19, 18h 34m UT: Nikkor 500mm f/4 with 2x converter; 8 sec, exp, D300 SLR, ISO 2500. The brightest star in the field is TYC 2381-171-1 vis. mag. 8.75, spectral type: A3. Skyap11 comparosin (right). 2018 Dec 16. Comet 46P/Wirtanen. We experienced continuous gale force winds (SE force 10 occasionally gusting to force 11), together with heavy rainfall, over the past 48 hrs. Conditions improved early on he 16th so that by evening that day skies cleared giving reasonable transparency, though the Moon (64% phase) in Cetus gave considerable sky illumination. We therefore decided to use (in addition to the faster lenses of shorter focal length) both the 300mm f/4.5 and 400mm f.5.6 with exposures of up to 45 seconds in the case of the later. The results were reasonable, all things considered. 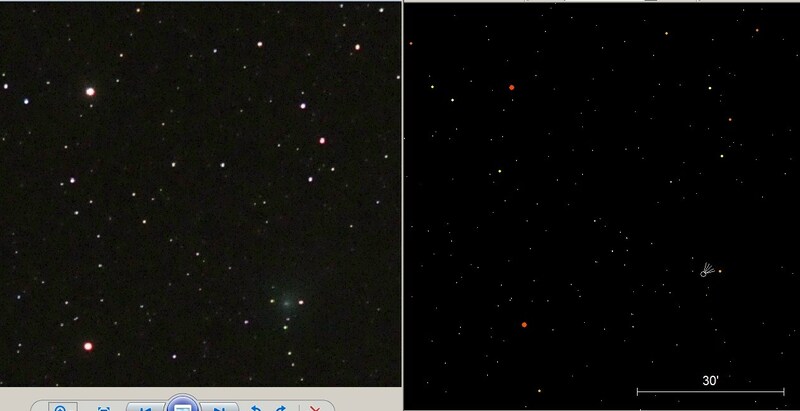 We also employed the 180mm f/2.8 and 300mm f/4.5 for Comet 64P/Swift-Gehrels. 2018 December 16, 16h 59m. Nikkor 105mm f/1.8 D300 SLR ISO 2000, a 2.5 second exposure. The position of the comet is indicated between the two, white horizontal lines. 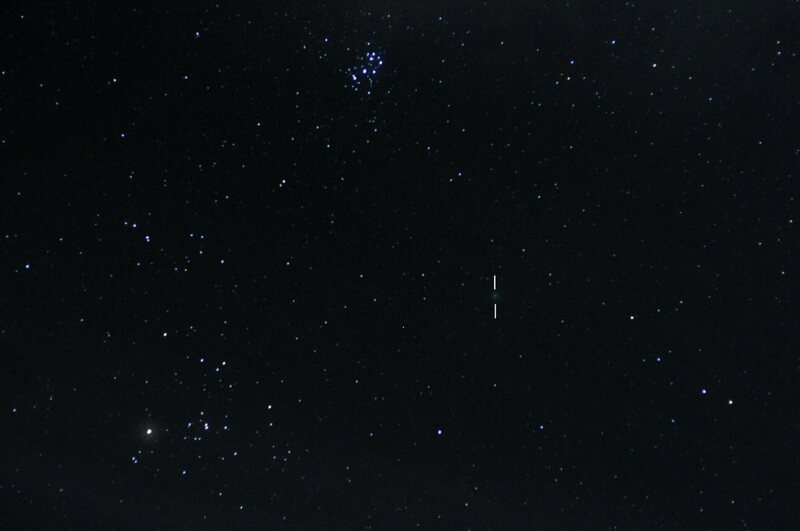 Pleiades (above right). 2018 December 16, 17h 40m. Nikkor 400mm f/5.6. A 30 sec. exp. D300 SLR ISO 2500. VERMIN of the SKIES: One of a number of instances in which artificial Earth satellites crossed the frame. 2018 December 16, 19h 43m. Nikkor 300mm f/4.5. A 30 sec. exp. D300 SLR ISO 2500. Limiting mag. 14 despite presence of the Moon. 2018 Dec 14. Comet 46P/Wirtanen. Another turbulent day giving way to an even more provoking night’s observing from yesterday with a force 9 gale (gusting to force 10), fluctuating high cirrus, but yielding an occasional relatively clear "window". The Moon (phase 44%) in Aquarius limited exposure times to less than 20 seconds. Again, we worked with a range of devices from a static 50mm f/1.4 lens to equatorially driven 105mm, 180mm f/2.8 and 200mm f/2 lenses. 2018 December 14, 18h 42m. Nikkor 50mm f/1.4 D300 SLR ISO 2000, a 6 second exposure. 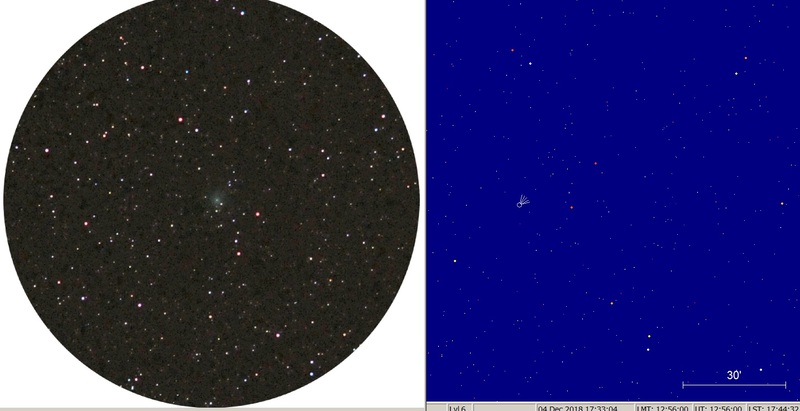 The position of the comet is indicated between the two, white vertical lines. 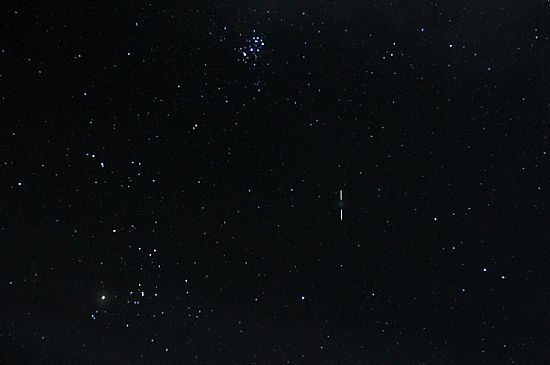 Both the Hyades cluster (left with the brilliant Aldebaran) and Pleiades (above left) open clusters are again included in the field. 2018 December 14, 19h 43m. Nikkor 180mm f/2.8. A 15 sec. exp. D300 SLR ISO 2500. The brightest star in the field (cropped image) is TYC 1253-716-1, mag. 5.97. 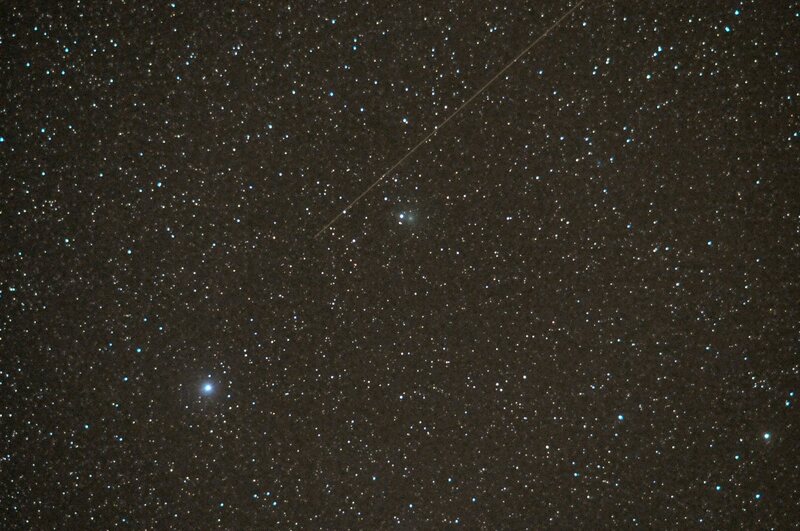 We also managed to record, with the 180mm lens, the much fainter 64P/Swift-Gehrels at a much higher altitude. Another turbulent day giving way to an equally provoking night’s observing pattern with a force 9 gale, fluctuating high cirrus, but never yielding a clear sky, added to which there was a crescent Moon (phase 38%) in Aquarius setting at 21h 42m. We persisted with a range of devices from a static 50mm f/1.4 lens to equatorially driven 105mm 135mm and 180mm f/2.8 lenses. In the event, we managed a number of interesting images of the comet, albeit severely compromised by the presence of a cirrus foreground. 2018 December 13, 19h 23m. Nikkor 50mm f/1.4 D300 SLR ISO 2000, an 8 second exposure. The position of the comet is indicated between the two, white vertical lines. 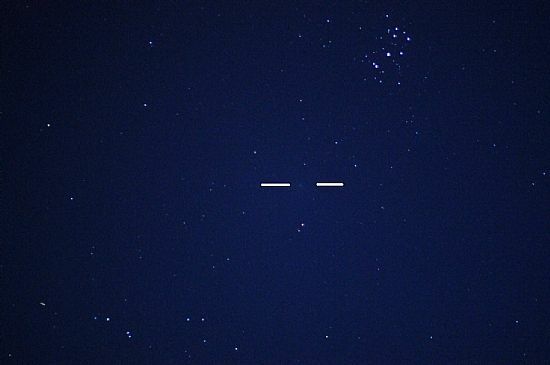 Both the Hyades cluster (left with the brilliant Aldebaran) and Pleiades (above left) open clusters are included in the field. 2018 December 13, 19h 43m. Nikkor 135 f/2.8. A 25 sec. exp. D300 SLR ISO 2500 (left): right: from star map for comparison and reference. The brightest star in the field (cropped image) is 5 Tauri, vis. mag. 4.13. Estimated integrated visual magnitude 4.8 for the comet. Note: The Moon will become a distracting presence for the coming 12 to 14 days by which time the comet (circumpolar from the 19th) will have passed close to the bright star Capella in constellation Auriga. 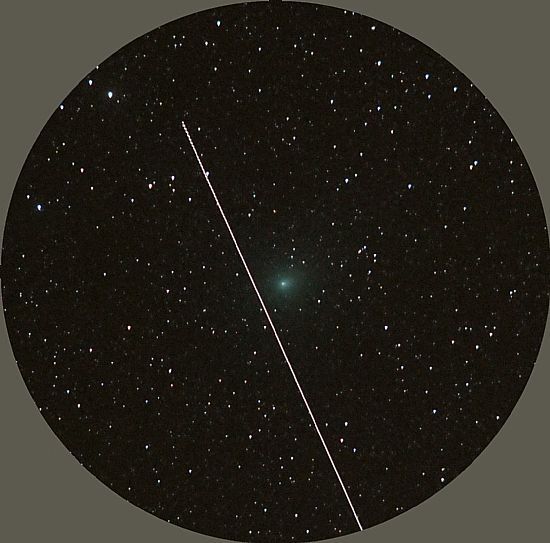 The comet has moved rapidly (4.2°per 24 hours) within the past few days from a comparatively low declination to now making it an easy object for northern observers readily visible in 8x30 binocluers. Our first opportunity to observe the come occurred this evening when despite a cloud-laden sky and winds gusting to force 9 from a SSE direction we managed a brief exposure with static camera. 2018 December 12, 19h 57m. Nikkor 50mm f/1.4 D300 SLR ISO 2000, an 8 second exposure. The brightest star close to the right of the comet is omicron Tauri, Visual magnitude: 3.61; spectral type: G8III. There was significant buffeting from the wind causing image "doubling". Currently, Comet P64/Swift-Gehrels is the only comet bright enough to be observed from the northern hemisphere with modest apertures (visually: 100mm aperture plus). 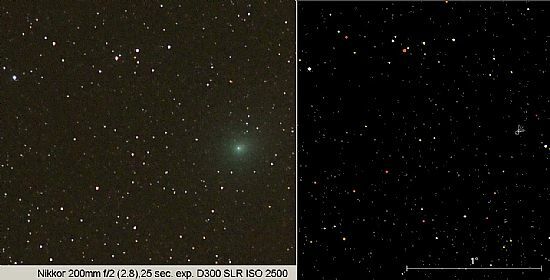 Photographically, with digital SLRs, the comet may be imaged with lenses of 70mm aperture working at f/2.8 in 15 seconds. (Equatorial drives at sidereal rate.) The comet is considerably brighter (by some 4.5 mag.) than predicated a few months back. Our latest images would indicate an integrated magnitude of a little brighter than mag. 10. The comet is conveniently placed in constellation Andromeda and at the time of writing (Nov. 12) may be found some 6° below the galaxy M31. 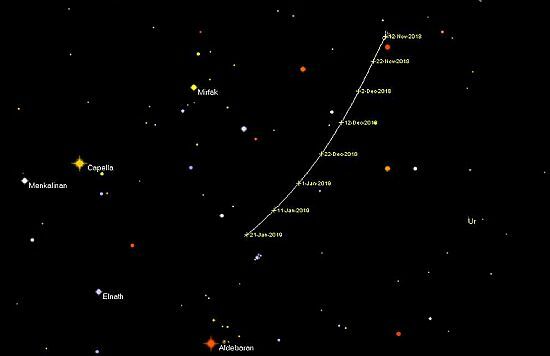 The diagram shows the passage of the comet up to 2019, January 21, when it will appear a little over 3° above the Pleiades open cluster in Taurus. We have been following the comet from early October. One of the most recent observations is shown in the image below. 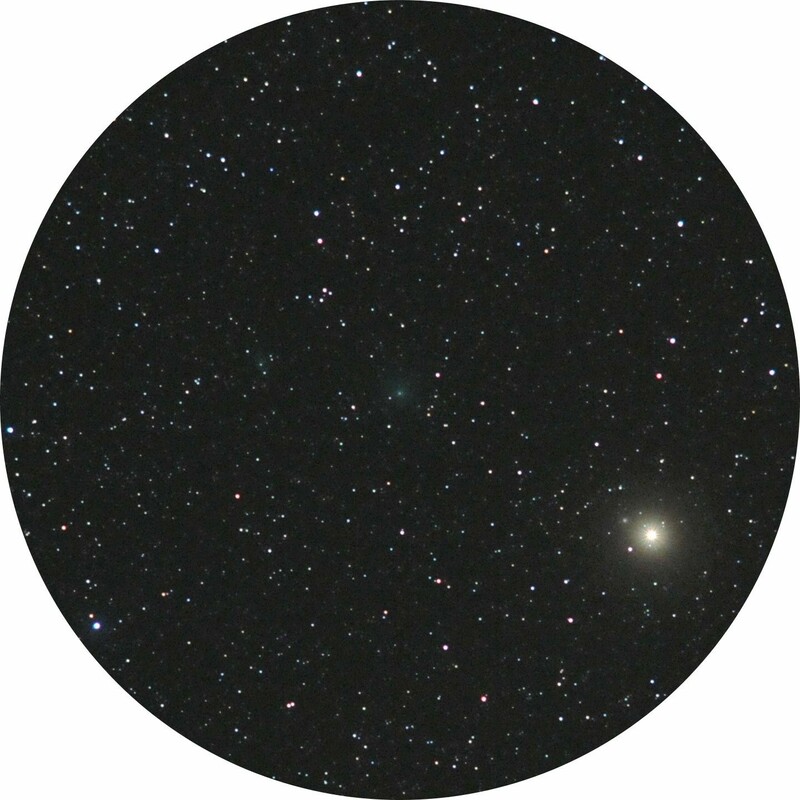 The field (cropped image) is approximately 2° 40' in diameter and shows stars to magnitude 15. 2018 Nov. 10 18h 35m, Nikkor 200mm f/2 stopped down to f/2.8. A 30 second exposure. D300 SLR, ISO2500. A brief clearance in the sky some two hours after sunset. Transparency 7/10. The bright star in the field is Mirach (beta-Androm. ), mag. 2.01. There was internal reflection from this star at exposures above 20 seconds. This has been masked in the image here. 2018 Nov. 13 18h 50m, Nikkor 200mm f/2 stopped down to f/2.8. A 25 second exposure. D300 SLR, ISO2500. 2018 November 18: Comet P64 and galaxy Mirach's Ghost. A "remarkable" 6 sec. exposure with a Nikkor 200mm f/ 2 stopped down to f/2.8. imaged at 19h 21m. The Moon was present in the sky at phase 79% just 42° below the comet. Despite the very short exposure and bright sky, (hence the short exposure!) both comet P64 and the galaxy NGC 404 (Mirach's Ghost) may be discerned in the photograph. The galaxy lies very close to the bight star Mirach (beta Andromedae, visual magnitude: 2.07) between the two yellow lines, top right), and is named Mirach's Ghost as representing a "fuzzy" image of the nearby star. NGC 404 is listed as having an integrated magnitude of 10.0 with angular size: 3.5 'x 3.5'. Allowing for the galaxy's proximity to Mirach we have estimated the comet's integrated magnitude as 9.6. 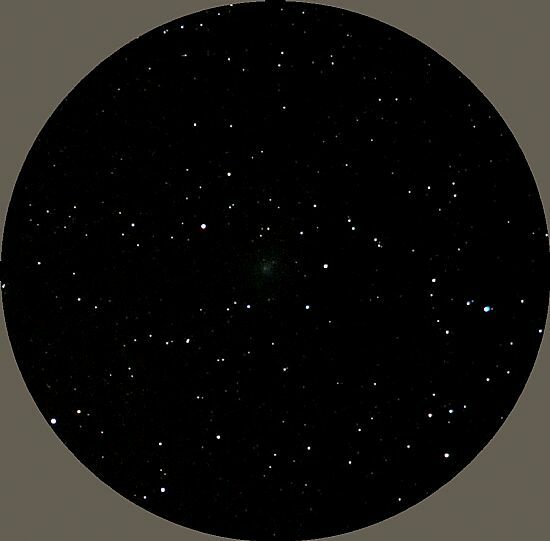 The star top left of the comet (between two vertical yellow lines) is TYC 2303-217-1 visual magnitude: 7.79 with a close "companion" to the right, TYC 2303-989-1 visual magnitude: 10.1. Field diameter 2° approximately. For a larger image of NGC 404 go to SIDEREAL page. 2018 November 26. Comet P64/Swift-Gehrels imaged at 18h 51m. Nikkor 200mm f/2 stopped down to f/2.8. D300 SLR: a 20 sec. exposure, ISO 2500. Diameter of field 2.5 approx. The brightest star in the field is TYC 2305-1639-1visual magnitude: 6.67. Limiting visual magnitude: 14.5. Opportunity snatched between cloud coming and going. Moon, phase 84%, had only just risen in NW thereby limiting length of exposure due to background sky illumination. 2018 November 29 20h 35m UT. Nikkor 200mm f/2 stopped down to f/2.8. A 25 sec. exp. D300 SLR ISO 2500. Transparency 6/10. Fleeting cloud with few clear gaps. Wind SW (var) force 6-7. Field dia. 1.2° approx. Brightest star in field TYC 2302-1580-1 visual magnitude: 5.63; spectral type: B9IV-V. Limiting mag. 13.5. 2018 Dee. 01, 19h 43m UT. Nikkor 200mm f/2 stopped down to f/2.8. A 30 sec. exposure D300 SLR ISO 2600. Brightest star in field is TYC 2302-396-1Visual magnitude: 9.15 field dia. 1.3 approx. 2018 Dec. 03. 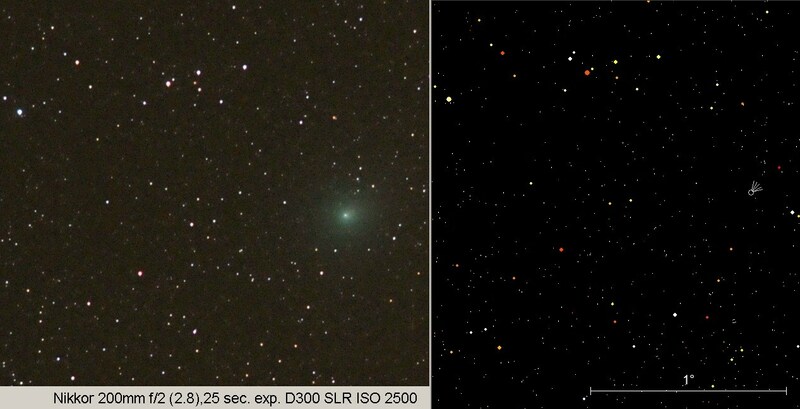 Two observations of the comet separated by 3h 22m (Exp. times:18h16m and 21h 38m). In the first exposure the comet is in line with the star TYC 2315-212-1 (Visual magnitude: 7.61). 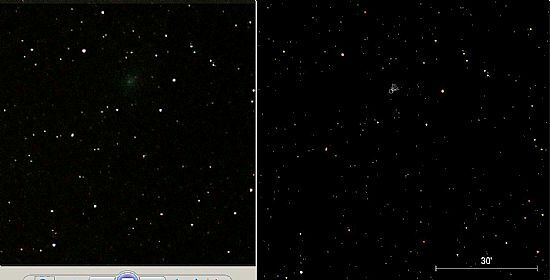 We made several attempts at improving the quality of the image but the sky was awash with artificial satellites, one passing across the central image itself! Conditions were far from rosy, with a strong NNW wind and temperatures close to zero degrees C. The first series of observations had to be aborted when a mixture of hail and rain started to fall. Observations were resumed later with the comet close to maximum altitude, having just passed the meridian. Field diameters 0.8° approx. limiting visual magnitude 15. Nikkor 200mm f/2 stopped down to f/2.8. 25 sec. exposures D300 SLR ISO 2600. 2018 Dec. 04. The comet imaged at 17h 33m UT shown next SkyMap11 with predicted position according to our most recent orbital elements. There is a marked discrepancy between observed position and predicted position. Nikkor 200mm f/2 stopped down to f/2.8. 30 sec. exposures D300 SLR ISO 2600. The comet's present position (181205) in space is to be found some 280,000 km outside the orbit of Mars and some 40 arc-degrees east of the planet as viwed from Earth. 2019 December 09. Vermin of the Skies. Things got even worse when attempting to image the sky with exposures of more than five seconds or so. A typical example if given below showing an AES to the left of the comet P64. It has now become necessary to monitor the field visually so as to be able to abort an exposure should an AES appear in the field: 1 in 3 exposures are frequently wrecked from this intrusion. And here is a salient thought. These AESs are constantly increasing in number (we’ll not discuss the motivation for this clobber) and eventually, when we have done for ourselves down through global warming or nuclear disintegration, this vermin will continue to haunt the skies for thousands of years to come. I rue the day mankind was able to beat the escape velocity from planet Earth! Nikkor 200mm f/2, a 12.5 sec. exposure D300 SLR, ISO 2500. 17h 48m UT. The brightest star in the field is beta Trianguli, visual magnitude: 3.00. Nikkor 200mm f/2, a 15 sec. exposure D300 SLR, ISO 2500. Cropped image. The first opportunity to search for the comet since the 3rd Marchj. A break in cloud from 21h to 22h UT with good transparency (9/10) and variable seeing (av. 7/10). Wind SWW force 5-6.